Back in January (Friday the 13th, to be exact), HGSP was lucky enough to rope Naked City Brewing into brewing a collaboration with us for NHC. Since the club recently scored a 30 gallon whiskey barrel, it didn't take long for us to decide that our joint-effort would be a barrel-aged imperial stout. A few short months later, Don Webb (head brewer/owner) invited the club to the brewery to see how the barrel was progressing. Fortunately, both the barrel and non-barrel aged versions came out really well. So well, in fact, that I decided I needed to take a stab at brewing up a clone. 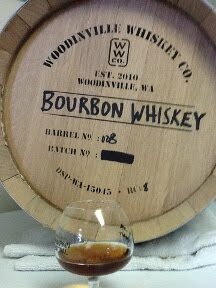 As luck would have it, a distillery just a few miles from my home, Woodenville Whiskey Co., was just about to dump several 8 gallon barrels of their Bourbon Whiskey. 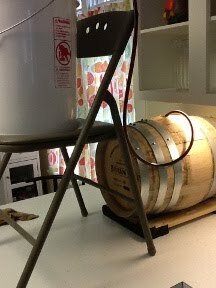 The idea of being able to pick up a local bourbon barrel was just too tempting, so I promptly placed my order for a barrel, and began drafting up the recipe for the base beer. I modeled my recipe on Opacity (recipe and specs can be found here), but did tweak it slightly as I tend to prefer my stouts to be a touch roasty-er. I subbed out half of the roasted barley and replaced it with equal parts of black barley and black patent. My system only allows me to brew 5 gallons at time, so I had to do two batches. For the first batch, I used Nottingham dried yeast. Despite fermenting in the low 60's, I picked up a bit of an ester in the aroma of the finished beer. It wasn't too distracting, but I decided to ferment the second batch with a clean American strain (US-05). While both batches were similar, I thought the aroma of the US-05 version was better and it was also closer to the Naked City version. With both batches being blended the ester from the first batch was barely - if at all - noticeable. I'm hoping that bourbon aromas along with a little time in bulk aging will annihilate any remaining ester before NHC rolls around. The plan is to serve Mrs. Voorhees at NHC Club Night, right next to her older brother, Opacity. Having the two served next to each other will be a great way for homebrewers to compare the differences of aging in a small barrel (8 gallon) verses a more traditional-sized barrel (30 gallon).